Daily Illuminator: Could They Be Called Transhumanitarians? January 13, 2014: Could They Be Called Transhumanitarians? In the future, when disaster strikes anywhere from the ground below to the moon above, the NKKC (Japan Emergency Rescue Agency) is there to help. 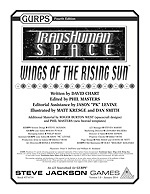 Transhuman Space: Wings of the Rising Sun brings you information on these high-tech humanitarians: their history and philosophy, their personnel roles and cutting-edge technology (with GURPS stats), GURPS Spaceships for their satellites and drop ships, and much more. It also includes campaign advice and adventure possibilities to include the NKKC in a range of high-pressure situations. Be part of a noble group who wants to save lives in the often-hardscrabble future of Transhuman Space. With Transhuman Space: Wings of the Rising Sun, you'll learn why the NKKC strives to live up to its motto: "Even One More."